We know what you’re thinking; only a crazy person would try to take on New York City in 48 hours. And, you'd be correct. But we’re a little bit crazy here at The Urban List and we like to make the most of every minute, so if all you can manage is 48 hours in the city that never sleeps, you damn well better take it. If you can manage more, lucky you—we’ve got some extra tips at the bottom that you might enjoy! Make your life super easy and book as much as you can before you go. 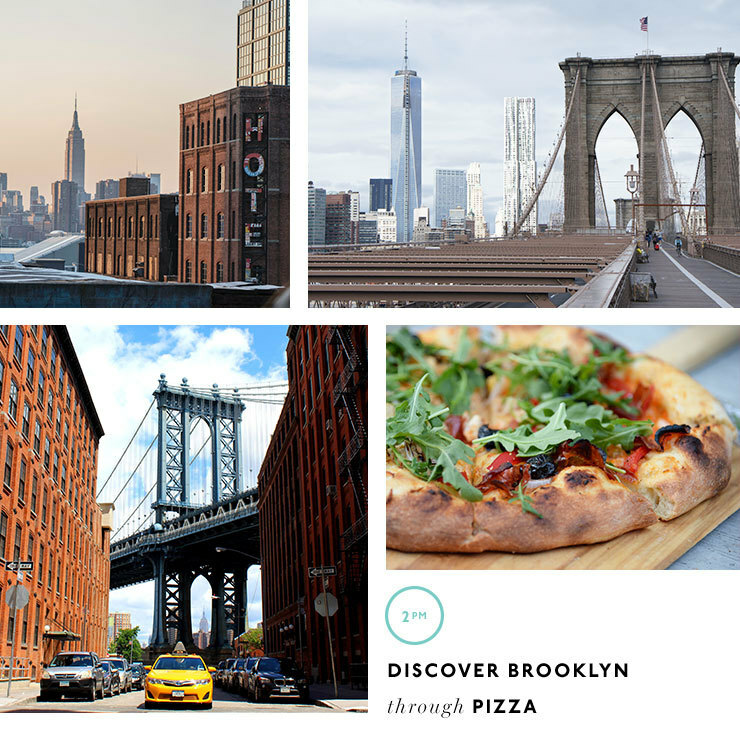 We used Expedia to book our flights, hotels and a couple of the amazing tours we did (including the Brooklyn pizza tour—yes, it's New York, of course there's a pizza tour). If you really love the hustle and bustle of city life, you’ll want to stay at Arlo Nomad or Moxy Times Square. Both of these boutique hotels are next level and while the rooms are small, they are well designed and have plenty of communal living spaces so you won’t feel too cramped. On the other hand, if you like to escape the crowds every once in a while, book yourself a room at Arlo Soho. Not only is it a little more chilled, it also has a candy store in the lobby, two bars (one on the rooftop—heck yes) and a fab restaurant, Harold’s Meat & Three. There is no time to waste. Get up and grab a quick breakfast. If you’re staying at Arlo Soho they have a delicious buffet where you can get your avo fix, and if you’re at Arlo Nomad there’s a bodega downstairs which sells delicious eats like avocado and fried egg croissants (drool). Once you’ve got some food in your tum, jump on the subway and get yourself to the meeting point for the Walk This Way Thru Harlem tour run by Hush Hip Hop Tours. Even if you don’t consider yourself a massive hip hop fan, trust us when we say you’ll enjoy this tour. You’ll learn a bit about hip hop and a lot about Harlem, which is a truly stunning borough with a very interesting history. If the Harlem tour isn’t running on a day while you’re there, Hush run plenty of other tours, but make sure you get to explore Harlem another time, not least so you can head to Red Rooster for a feed. Speaking of, Red Rooster in Harlem is an absolute must—and not just for the food (though you absolutely must order the crispy bird sandwich). If you can spare an evening, there is live music every night except Wednesday. And, if you can manage to get there on a Sunday morning, there’s a gospel brunch downstairs in Ginny’s Supper Club and we’re willing to bet it would be one heck of an experience. You’ve got a couple of free hours ahead of you so it’s time to decide what you want to do next. 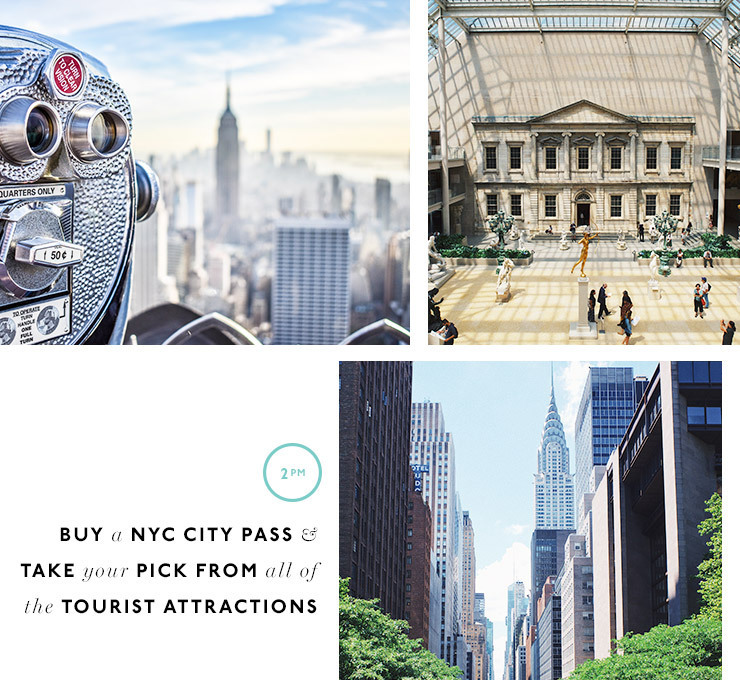 If you’re gagging to see all of the tourist attractions, do yourself a favour and buy a NYC City Pass and take your pick from The Empire State Building, The Natural History Museum, The Met, the Top Of The Rock or one of the other attractions included. Let’s be honest, you can’t go to NYC and not indulge in some of the touristy stuff. If it’s a nice day, you’ll definitely want to head to the top of The Empire State Building or Top Of The Rock to take in some seriously wow-worthy views. If the weather’s not so good, pop in to the Natural History Museum for a bit of fun or the Met for some culture. If you really want to avoid all the tourist attractions, get yourself to lower Manhattan for a spot of shopping. RIP credit card. You’re off to watch some sport tonight, so it’s time for a couple of drinks and some snacks—just remember not to fill up, you need to save space for some real American hot dogs, chips and beers. Even if you’re not staying at Moxy Times Square, head to their rooftop bar, Magic Hour and just take a minute to check out the Empire State Building in all of its glory. Now that’s done, order yourself a Float My Boat cocktail—tequila, caramelised pineapple and jalapeno syrup—a Maine lobster roll and the carnival potatoes. Once you’ve downed your delicious cocktail, head to Madison Times Square and get ready to spend the rest of your night drinking cheap beer. Whether you’re a mad sports fan or don’t know the difference between NRL and NFL, going to a live sports game in America is a must—we don’t really care what sport you choose, just try and get yourself to Madison Square Garden, because New York. The basketball and the ice hockey are both loads of fun, just choose a team (the home team, please) and start cheering! Our hot tip: jump on US Sports Tickets and lock your tickets in before you leave Australia! Up for a spot of show tunes after all that beer? Head to Marie’s Crisis in the West Village. It’s been around since the 1850s when it was a prostitutes’ den but is now a piano bar where you are guaranteed to have a good night. If you can manage to lift your head at 9am, head to The High Line in Chelsea for a walk and some fresh air. There are some great views, just keep your fingers crossed for blue skies. It’s time to discover Brooklyn through pizza. Ummm yes. Book yourself a spot on A Slice Of Brooklyn Bus Tours for a seriously great day out. The tour guides are ace and we quickly developed a girl crush on our tour guide Paula, plus seeing Brooklyn by bus means you get to see wayyyyy more than you would otherwise. The tour starts in Manhattan, but another must-do while you’re in NYC is the walk over the Brooklyn Bridge! On the tour you’ll go to Grimaldi’s and taste the best damn Margarita pizza of your life—just watch this and try not to salivate. You’ll also head to L&B Spumoni Gardens for a Sicilian-style pizza which is also pretty excellent, but the tour about more than just the pizza. You’ll drive through all the neighbourhoods of Brooklyn, which are beautiful, and you’ll finish up with a walk through Coney Island. The tour officially ends in Manhattan, but you’ve got more of Brooklyn to see so let them know you're going to jump in an Uber and head to Brooklyn Brewery. Brooklyn Brewery was started by a couple of friends who hated their jobs so started brewing beer at home. The history is actually far more interesting than that, so if you’re interested click here, but if you just want to taste beer, get yourself to their tasting and tour at 5pm each day from Monday—Thursday, or check their website for tour times from Friday—Sunday. You’ll taste loads of delicious beer and learn a bit too. Win. Walk around the corner to Brooklyn Bowl for a striking good night! Order some margaritas, the buffalo cauliflower, mac and cheese bites and the nachos. Heck, just order everything, you’re going to work up quite the appetite showing off your bowling prowess. There’s often live music here, so if you’re lucky enough to have found something good playing, stick around and enjoy the show. Otherwise, it’s time to move on. Wythe Rooftop Bar is just across the road from Brooklyn Bowl and there are some stellar views of the city, and if that doesn’t tickle your fancy, head to Westlight Rooftop Bar which is on top of the William Vale hotel. We all know by now that you could spend two months in NYC and still not see everything you want to see, but here are a few other things we’d recommend adding to the list if you have more time. See a show at St Ann’s Warehouse in Brooklyn—the glass rooftop means you can see the Brooklyn Bridge lit up in all its glory. Grab dinner at Cecconi’s before the play—the views of the Manhattan skyline are impressive, to say the least. Get hot chips and a cocktail at Happiest Hour in the West Village—did you know they don’t have chippy salt in the US? Luckily an Aussie chef made his own and the chips here are next level. If you’re craving some Aussie classics, head to Ruby’s in NoLiTa or midtown for Vegemite on toast, or delicious sweet corn fritters. We already said this one, but walk over the Brooklyn Bridge! Jump on the ferry to Staten Island. 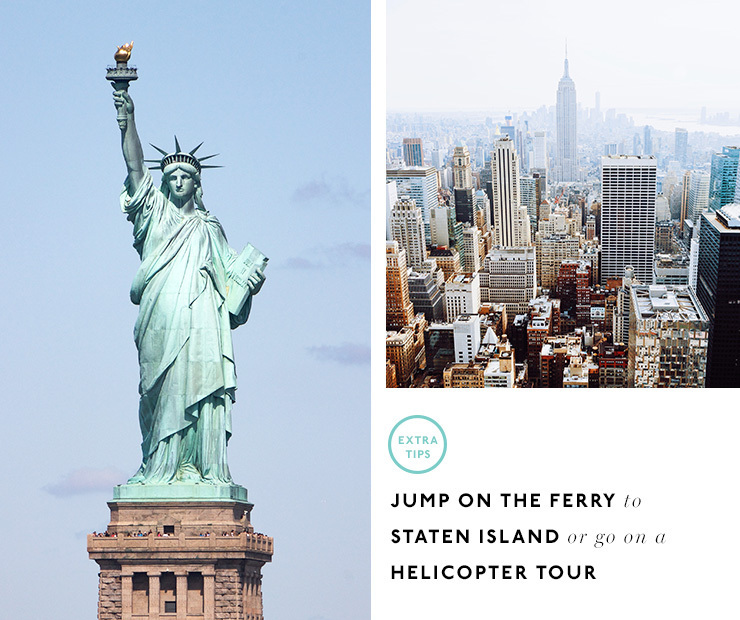 Don’t bother getting off, but you’ll get great views of the Statue of Liberty and it’s FREE! Check out the Rockefeller Centre. If it’s winter, you must go ice skating. If you’re a baller, go on a helicopter tour. Editor's Note: The author of this article was hosted by Brand USA and Expedia in New York City.